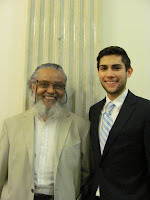 Editor's Note: Enjoy this great post about Transgender Equal Rights Lobby Day by Matt Bennet, our public affairs assistant, pictured at right with State Rep. Byron Rushing. I often think that humans only act in their own self-interest, putting in their best when they will seemingly benefit the most. However, last Thursday at Transgender Equal Rights Lobby Day at the Massachusetts State House, I saw hundreds of allies of the transgender community come out to support the passage of the Transgender Equal Rights Bill. Inspirational speeches from legislators such as Rep. Byron Rushing and Sen. Sonia Chang-Diaz showed the unity of an LGBT community that is often pushing for vastly different policy changes, legislation, and modes of social acceptance. Hearing from a transgender military veteran and being reminded of the daily discrimination experienced by the trans community was enough to bring a grown gay man to tears. (I didn’t. I swear.) It was beautiful to see lesbians, gays, and bisexuals going to lobby for the rights of transgender people, many of them friends, coworkers, family members, and life partners. After the speeches, over two hundred activists descended upon the offices of their legislators to implore their support for the bill. I am grateful that my state representative, Kevin Honan, is a co-sponsor of the Transgender Equal Rights Bill in the House, but I met with an aide Sen. Steven Tolman to ensure his place on the right side of history. After a short 15 minute chat, I was assured that Sen. Tolman was a “huge supporter” of the bill, although it is his policy as Assistant Senate Majority Leader to not sign on as a co-sponsor of the bill. Although our battles have resulted in hard-won victories, we have a long road to walk. As we come to the close of LGBT Pride Month, this is an excellent reminder of why we come together, for we know there is strength in our solidarity and power in our numbers.